"Just five more minutes," you say to yourself. Five more minutes of YouTube, or your favorite news site, or a gorgeous design blog--anything, as long as it's not work. But those five minutes all too often become 30 minutes or more, and suddenly you realize that you barely got any real work done. Free Chrome add-on WasteNoTime tries to save you from that moment by helping you limit the amount of time you spend on distracting websites. The add-on works well, but does not always achieve the intended outcome. WasteNoTime allows you to instantly lock down Chrome so you can avoid distractions when trying to focus. 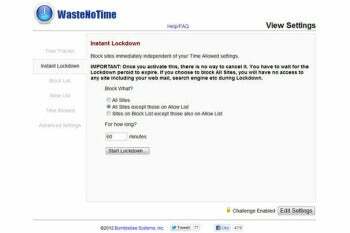 WasteNoTime, which also comes in a version for Apple Safari, is closely modeled after Firefox add-on LeechBlock. Like LeechBlock, it lets you configure a blocking schedule, and easily add websites to block. For example, you can ask it to let you waste up to 30 minutes in aimless browsing, between 9 a.m. and 1 p.m., and then browse your favorite websites, knowing the add-on will just stop you when your time is up. One of WasteNoTime's few interface shortcomings is the lack of visual indication when browsing a blocked website. On Google’s browser, to verify that the current website is indeed blocked and check how much time is left, you must click the WasteNoTime button on the Chrome toolbar. 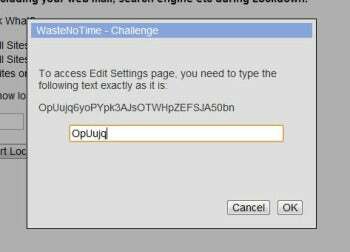 You can ask WasteNoTime to challenge you with a random string of letters and numbers before you can change its settings. As soon as you exceed the time quota, WasteNoTime will redirect you to a block page instead of the time-wasting website you were trying to get to. The page asks, "Shouldn't you be working?" and displays rotating motivational quotes. You can also replace the default block page with any other page of your choice. Just like LeechBlock, WasteNoTime lets you protect the options screen with a long string of randomly generated letters and numbers. If you want to change the options (to unblock a website, for example), you'll have to type that case-sensitive string without making any mistakes. This takes a moment and gives you a chance to think about what you're trying to do, and resist temptation. Unfortunately, all it takes to foil WasteNoTime is just a single keystroke -- Ctrl+Shift+N. This key combination instantly launches Chrome's Incognito mode, and by default, add-ons don't run in this mode. WasteNoTime's pop-up menu shows how much time you still have for browsing distracting websites. So unless you explicitly allow WasteNoTime in Google Chrome's Incognito mode, it really isn't very effective. Of course, you can always just start a different browser, too; many PCWorld readers have more than one installed on one or more PCs. The ease of getting around WasteNoTime is the real danger here. It is all too easy to forget that you're the one who placed these restrictions in the first place. As soon as it becomes a game of "You vs. Add-on," procrastination wins. But if you remember why it's there, WasteNoTime can be a helpful way to bolster your willpower. Note: The Download button takes you to the vendor's site, where you can download the latest version of the software appropriate to your Google Chrome or Apple Safari browser. This add-on for Google Chrome and Apple Safari lets you set time limits for browsing distracting websites, but if you aren't careful you can disable its features.